The latest TFAS SG Ranking as at 6 October 2014 is now officially released!! It includes a one-time adjustment for the award of ranking points for Mini-Tournaments as catered for in the v2.0 revision of the TFAS SG Ranking System. Another one-time adjustment was also made due to player withdrawals in the SGTF Premier League. 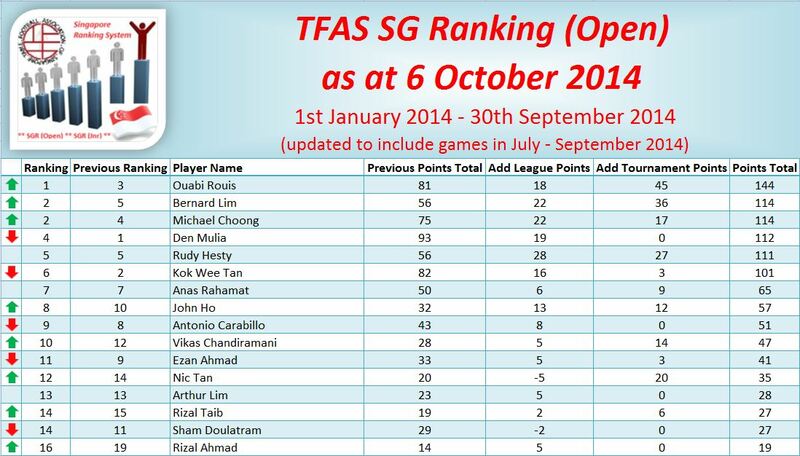 The current Number 1 top-ranked player in Singapore is our French friend, Ouabi Rouis!! His great form in winning 3 consecutive Mini-Tournaments made a telling contribution to his surge up the SG Rankings as he takes over from Den Mulia. Congratulations Ouabi Rouis!! 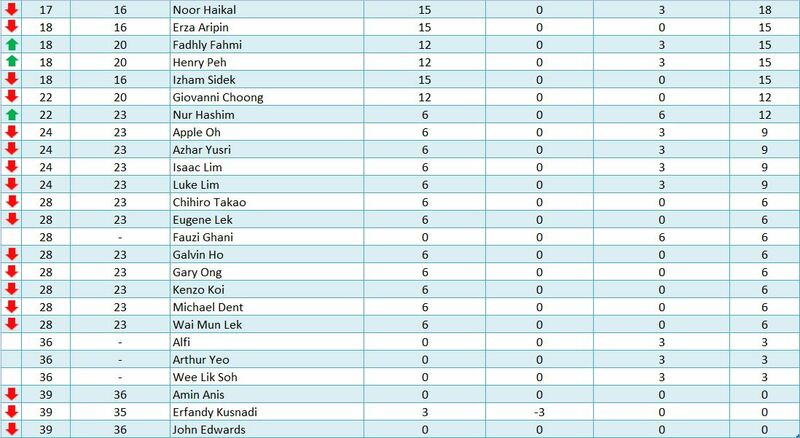 Tied at Number 2 are Bernard Lim (our Singapore rep at the recent Rochefort World Cup) and Michael Choong (1 of our top player in Singapore) as they moved up 3 and 2 rankings respectively. Over in the Junior rankings, Giovanni Choong continues to remain as the Number 1 Junior player in Singapore. Congratulations Giovanni!! Both Isaac Lim and Luke Lim (Singapore’s first and only U12 players to ever compete in a FISTF World Cup) also consolidated their Number 2 and Number 3 rankings respectively. This trio of up-and-coming youngsters have certainly made their mark in the first 9 months of 2014 and established themselves as the top 3 Junior players in Singapore. Well done boys! !